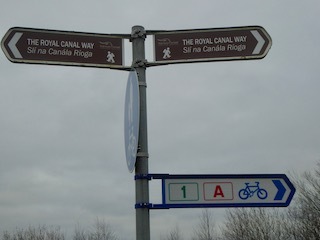 Well, he wasn’t referring to a bicycle-frame triangle… but now with the relatively new 144 km Royal Canal cycle route from the River Liffey in Dublin to the River Shannon in Longford, the old triangle takes on a whole new meaning! 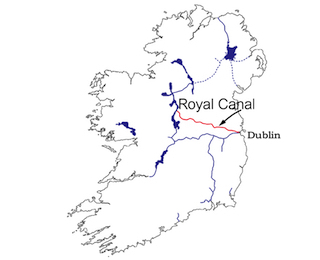 On our visits to Darina’s homeplace, we always saw the Royal Canal pathway from the train window, and wondered how far it would take us. 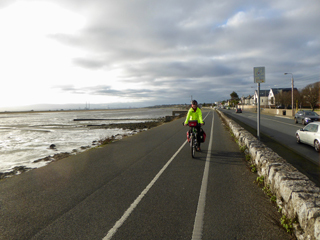 So, this Christmas, we decided to give it a go on our bikes. 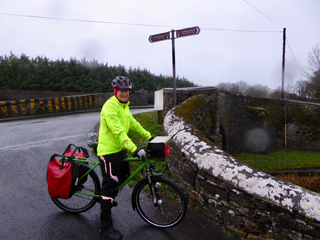 It mightn’t be the perfect travel season for Ireland but we had friendly smiles the whole way, and a warm shower at the end of every day! 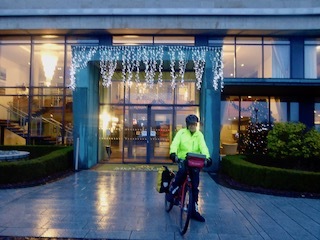 Due to our late arrival in Dublin, we took a Citylink bus (5€/bike) to Enfield, from where we had a short night ride to the Moyvalley Hotel & Golf Resort. 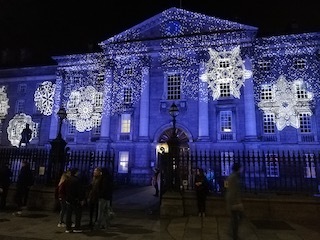 Sounds posh – and so it is! 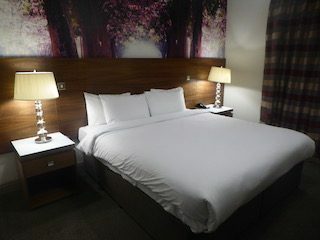 But they had very reasonable corporate rates for late stragglers like us. 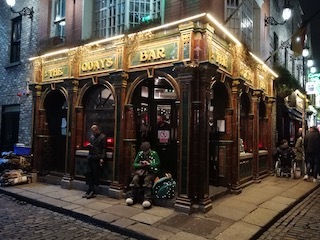 And their restaurant wasn’t bad either! 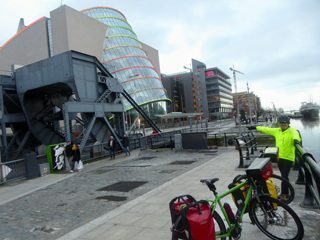 Days are short in December, and so the next morning we were up bright and early for a full Irish breakfast, and we were on our bikes at the crack of dawn. 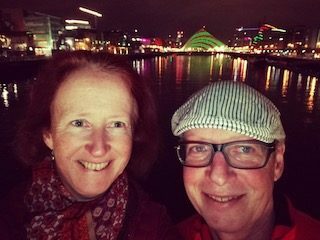 Under an overcast sky, we followed the old life line of the midlands, while a heavy mist worked wonders on our complexions! 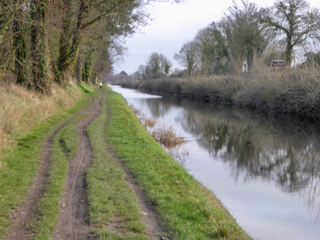 The canal was often on an elevated dam, affording us views of wintery fields left and right. 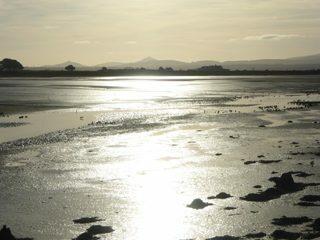 Before Mullingar, it was carved into rocks for a bit of variety. 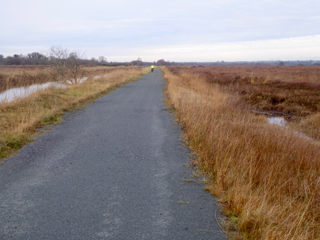 There, a Greenway leads off on an old railway line to Athlone, a project that will be continued all the way to the west coast. And the sheep are as happy as Larry! 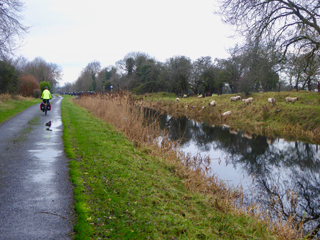 We stayed on the canal until it was time to turn off to Darina’s family in Moydow. 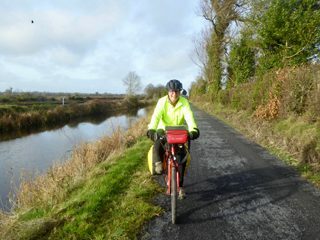 In total we had done a 100 km on pleasant surfaces ranging from hard gravel to tarmac. 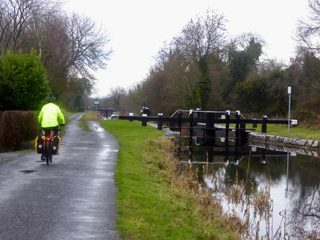 After the turkey and ham, we cycled the arm of the canal that leads to Longford; a stretch that seemingly should be done up this year (2019). 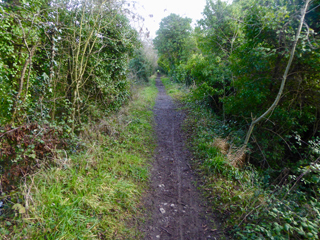 It was a bit unkempt and muddy in places, but rideable. 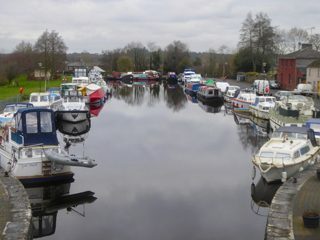 Another day we made it to the River Shannon end of the canal at the lovely Clondra harbour. 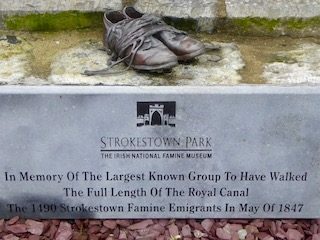 In Clondra, there is a monument commemorating the largest known group to have walked the length of the Royal Canal: The 1490 Strokestown Famine Emigrants in May, 1847. 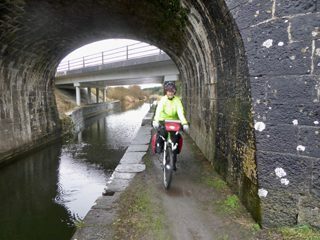 Once the turkey sandwiches were eaten, we took the train to Enfield and cycled the part of the canal we’d missed on the way down. 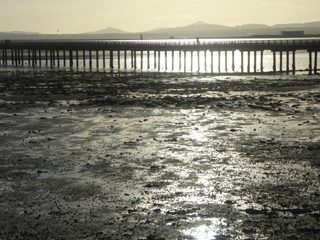 That day we had lovely sunshine but apart from Maynooth harbor, there was a serious lack of picnic spots or cafes. 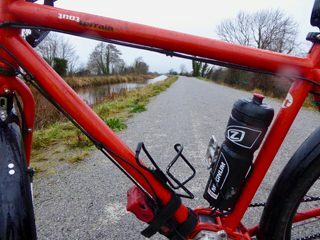 From Maynooth to Leixlip it was still easy riding, but at Clonsilla the path dwindled from a walking trail to a hiking trail three metres above the water on a slope full of wet roots and mud in between. 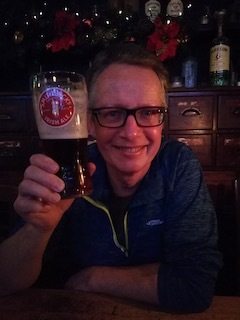 While the going was good! 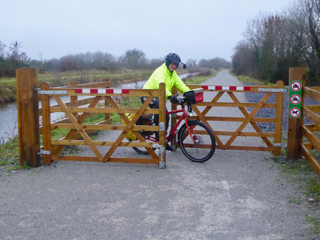 We decided to do the last stretch into Castleknock station (12th lock) on safe residential roads, before rejoining the dedicated cycle lane from there to the end at the River Liffey in Dublin’s Docklands. 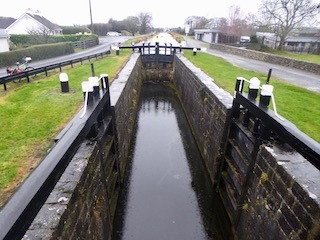 And as we passed Mountjoy prison, we missed the jingle jangle but a hungry feelin’ came over us stealin’ and Kurt had a serious craving for fish ‘n chips! 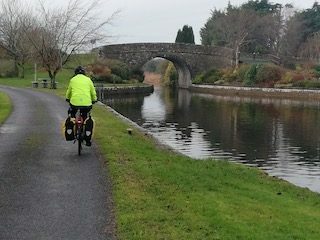 We can conclude that for cyclists with time on their hands and a desire to explore the Atlantic coast, the Royal Canal cycle route could be a pleasant and peaceful way to get there under their own steam. We would certainly use it again. 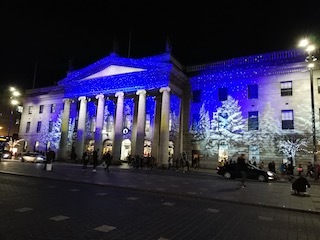 Dublin city was full of festive lighting. Whether it was for us or Christmas we never found out, but we loved it anyway! 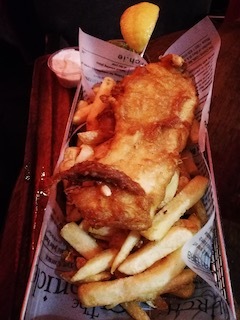 Well, Kurt got his fish ‘n chips and washed the lot down with a pint of local brew, as a few musicians entertained us with political, patriotic, romantic and lustful Irish ballots including… The Auld Triangle! 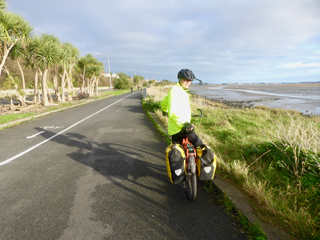 It certainly was a scenic route to the airport, as we cycled in glorious sunshine along Dublin Bay to Bull Island and on for a loop of Howth Head (the steepest we had on this trip). 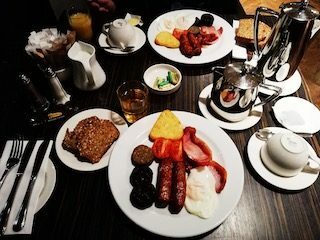 After a delicious lunch, thanks to Mary and Tony, we were ready for the last stretch to the departure gate, where Ryan Air managed to turn a simple baggage-drop-off procedure into a tedious, disorganised chaos!